Although it was not an upset on paper, the Western Mustangs defeat and elimination of the Wilfrid Laurier University women’s hockey team in double overtime was unfamiliar territory for the defending Ontario University Athletics champion Golden Hawks. The third ranked Mustangs took game two of the series in Waterloo Friday night in what turned out to be a thriller and subsequently a heartbreaker for the Golden Hawks. After making quick work of the sixth ranked Queen’s Gaels team a week ago, and leading 3-1 in game two, it seemed as though the Hawks had the Mustangs in an ideal spot on home ice. After reclaiming their spot atop the OUA a year ago, the Hawks found themselves in an extremely unfamiliar spot this season, falling out of the national rankings when many expected them to make a deep playoff run. Goals seemed to be coming in bunches at the Waterloo Memorial Recreation Complex on Friday. Western tallied their first marker only 23 seconds in, only to be one-upped by a goal by fourth-year Danelle Im 17 seconds later. According to head coach Rick Osborne, it was very important to respond with the sense of urgency that Laurier had following the opening goal. Two quick goals by Im and Dollee Meigs allowed the Hawks to enter the second with a two-goal lead. The edge was quickly cut in half just 23 seconds in the second frame by Western’s Kendra Broad. The Hawks were then bombarded by two goals in just about two minutes and saw their lead disappear. “I don’t know why we got a little bit out of sync in the second period. There were a couple of weird bounces around our net,” said Osborne. The quick goals chased first-year goaltender Nicholle Kovach from between the pipes and gave way to Laurier’s star second-year goalie, Amanda Smith, who had been given the night off. Smith’s entrance provided a spark as the Hawks notched a goal just over a minute later on the stick of veteran fifth-year forward Tammy Freiburger with just three minutes to go in the second frame. And just like that the goals stopped coming. The competition changed from a scoring frenzy to a defensive battle for the ages. Another puck did not squeeze past either sides goal line for another 48 minutes and 24 seconds. 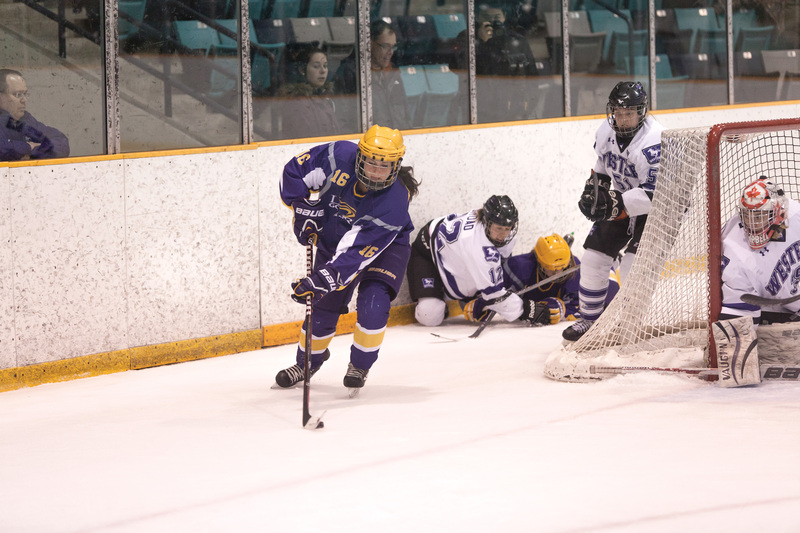 Smith and Western’s Kelly Campbell held their ground and lead their teams into two overtime frames, something Laurier was not afraid to venture into, according to Brooker. “We were very confident. We played Queen’s in overtime … but we had the momentum going in and we were very confident. As long as we played our game, we knew that we could get this game,” she said. However after a failed three on two early in the first extra frame, Laurier’s momentum started to falter. Eventually, a shot from the point was tipped home by Tia Kipfer, sinking the Golden Hawks playoff dreams. The Hawks and Rick Osborne enjoyed OUA supremacy from 2003 to 2009, capturing the championship every year. However, the past five years have proved more difficult for the squad as the level of play in the OUA has increased significantly during that time. “It speaks to the parity of the OUA this year — it’s probably the best parity I have seen in a while. One weird bounce has decided this series now,” said Osborne. The end of the season spells the end of the road for Freiburger and Brooker, who have made their impact in the purple and gold over the past five years. “They went through lots of ups and downs with me,” said Osborne. For Brooker, it wasn’t a time of looking forward, but a time of reflection. The Hawks will do it all again in the 2015-16 season with at least six fourth-year players hoping to return to the storied squad.